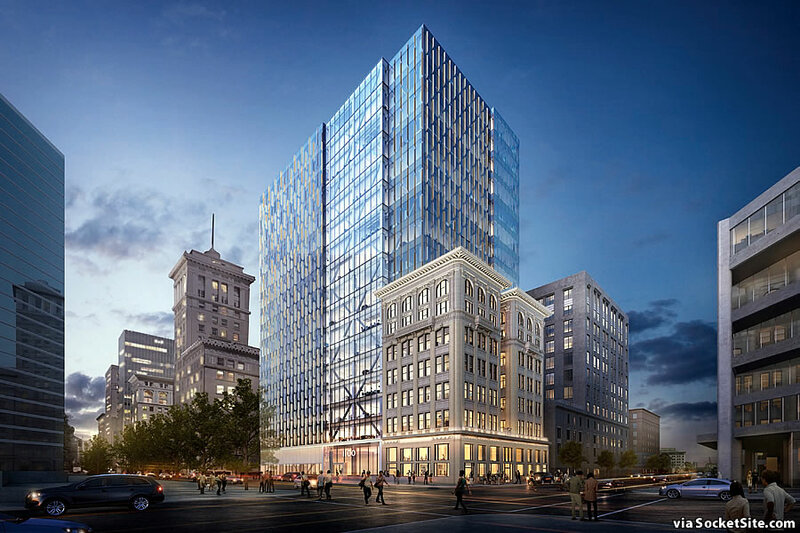 In a move which shouldn’t catch any plugged-in people by surprise the plans for an 18-story building to rise at 1100 Broadway in Downtown Oakland, the top floors of which would be cantilevered over the historic Key System Building have once again been redesigned. As we first reported last month, while Oakland’s Design Review Committee had voiced unanimous support for a new development on the barren site adjacent to the historic building, its members had also voiced concern with respect to the proposed development’s compatibility with its surroundings and context, concerns which Oakland’s Landmarks Preservation Advisory Board echoed. 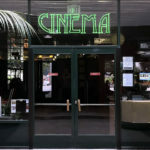 And based on the revisions, Oakland’s Design Review Committee and Landmarks Preservation Advisory Board have jointly declared that the proposed development “meets the criteria for Regular Design Review approval in the Planning Code,” which could clear the way for the project to be approved by Okaland’s Planning Commission. Keep in mind that Ellis Partners, which purchased the long-dormant project site a few months ago, has been aiming to break ground by the end of the year in order to have the new building, a third of which has been pre-leased to the University of California Office of the President, ready for occupancy in late 2019 or early 2020. And if you plug this into Babblefish and hit “translate: Burecratese>English” you get: “simpler>cheaper>better.” Now let’s hope after all the hard effort commenters here – and others like the actual developers, et al – have put in, it actually gets built. looks good, liking the visible cross-bracing. best iteration yet … now, APPROVE IT ! Much better. The previous design was hideous. And speaking of getting built – or not – since it figures fairly prominently in this picture, now might be a good time to mention that building on the right: oldtimers might recall that was the base of what was planned to be a 68 story building (back in the early 80s). I believe it was eventually upped to 78 stories…something having to do with feng shui, although that was an exotic word rarely used back then, and eventually more commonplace phrases like “crook” and “underfinanced” were the ones on everyone’s lips. So for those hungering for that skyline-busting building, remember (1) it’s nothing new, and (2) make sure you wish upon the right star. You mean the Trans Pacific Center Building with the exposed glass evlevators inside? Was that suppose to be a 78 story building at some point? I’d take a 40 story office building on this site. If we in the Bay Area are really interested in relieving traffic congestion and pollution, maximizing DTO properties next to BART stations is part of the answer. Sort of: it was the first block of what was to be a 4-square block project (initially or at least at some point) called “Hong Kong USA”; I believe the building itself was to be the next block over (where the Courtyard now stands). I don’t think any work was ever done on it, per se, the site just sat empty and finally became a parking lot. We did get Phase I out of it – which judged on its own merits isn’t so bad – so this scam was a cut above most. That’s right. Now it all comes back. Thanks for pointing that out. Great knowledge there. You are both correct regarding the Hong Kong USA project except that they did build the first phase. The six story building across from the street from the Key building along Broadway was the first of four block’s that were to be developed. Nice. This new design lets the beautiful historic Key System Building breath. The building should be taller since it’s right on top of the 11th Street entrance to the City Center BART station. 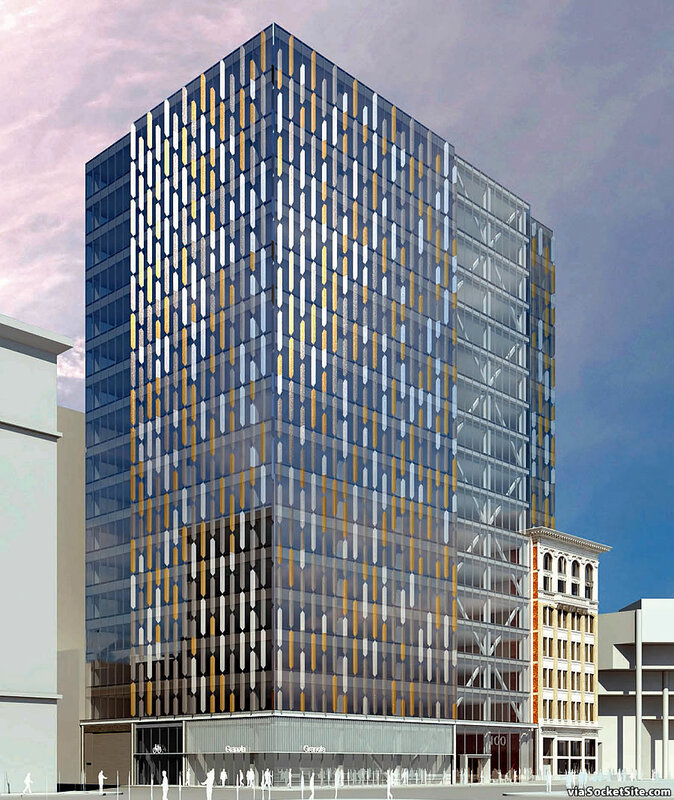 Let’s break ground on this and join the 601 City Center 24 story building now under construction. I’m still baffled why the entitled design is not being pursued. Yes, that first design wasn’t bad and was taller at 20 stories. Ok, so demand is now back and project must be redesigned? Demand would have been there if the companies who owned these parcels, and also had their huge SF portfolios, were really serious about recruiting companies to their land banked Oakland projects. 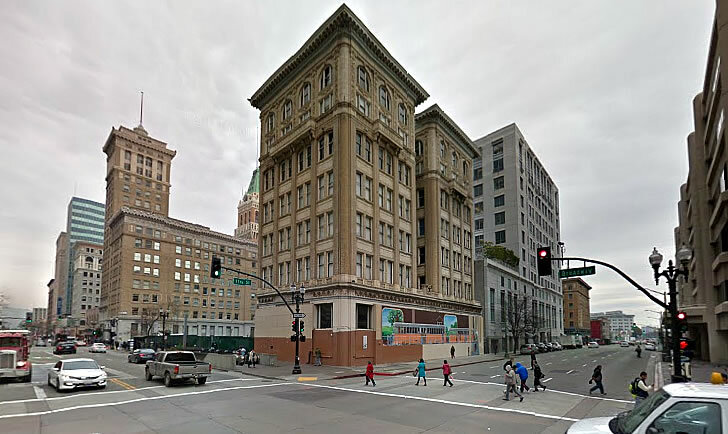 New office space in DTO next to BART stations will have no problem leading up. Yeah, I don’t get either. The project is only slightly smaller than the original. I’m confused, which happens easily, is the cantilever no more? Demand would be there if Oakland wasn’t still a scary, lawless place populated by far too many violent, angry people. Advice to Bay Areans: Stay out of west and east oakland unless you want to learn a ghetto attitude toward self-defense. Downtown SF has 5x the number of crimes. Chicago has no problem building highrises despite 700 homicides per year. You don’t seem to understand the difference between totals and rates. And you can’t be bothered to provide any actual citation. Ok. Oakland has a 2017 estimated population of 425,000 residents living in 57 square miles with around 31,000 yearly crimes. SF has a population of 850,000 residents living in 49 square miles and about 60,000 yearly crimes. However, we are talking about downtown specific areas in Oakland and SF where SF has far more crime in neighborhoods like the Tenderloin, Civic Center, 6th Street, Soma, etc. SF also has over 1200 crimes per square mile which is the highest crime density rate of any large city in the United States. Oakland is at around 500 crimes per square mile. SF is far more crime ridden than Oakland, meaning there are far more crimes committed in SF’s 49 square miles than in Oakland’s 57 square miles. SF also had 25,000 auto-break ins in 2016 compared to about 7,000 in Oakland. SF had 700 more violent crimes than Oakland in 2016. The media have turned these facts on their head over the decades with slanted and biased reporting in order to protect the SF tourism and real estate industries. Meanwhile, a “crime ridden, scarry” & “no there, there” narrative was created for Oakland. Sticking with your selected source and dataset, the chance of becoming a victim of a violent crime in Oakland is 1 in 69 versus 1 in 127 in San Francisco. But you’re right, the chance of being a victim of a property crime in Oakland (1 in 17) is 0.4 percentage points lower than in San Francisco (1 in 16), perhaps in part due to the relative concentrations of wealth and opportunity. Why were the crime linked sources taken away after someone else brought up crime as a false justification for someone to not lease property in DTO? My point still stands. SF has 2x the number of crimes and a much higher density of crime. Therefore, SF is more crime-ridden than Oakland, Downtown SF is much more crime ridden than downtown Oakland where 1100 Broadway is located. I don’t think Some Guy has spent much time in DTO, or Oakland in general. E. Gonsalves is obviously either certifiable or a line-item on somebody’s spin-control budget. No, just making sure folks understand that SF recorded 60,744 crimes in 2016 while Oakland recorded 31,000 crimes. Also, SF recorded 700 more violent crimes. SF also led the United States in property crime per capital along with crimes per square mile. SF recorded 1287 crimes per square mile. Much more crime in SF’s 49 square miles than in Oakland’s 57 square miles. Your move from the Tenderloin to Fruitvale was a huge upgrade. I am under the impression the BART system is at or near capacity, even taking the new trains into consideration. I am not sure the constant use of terms such as “transit rich”for buildings near BART stations is or will be accurate as more building are added. The BART system is at capacity heading to SF in the commute direction. Heading to Oakland from SF and the Peninsula is not a problem. Heading to Oakland from Fremont would also be a much shorter trip.